Believe it or not, one of my all-time favourite Christmas books is a Golden Book that I've had for 29 years! 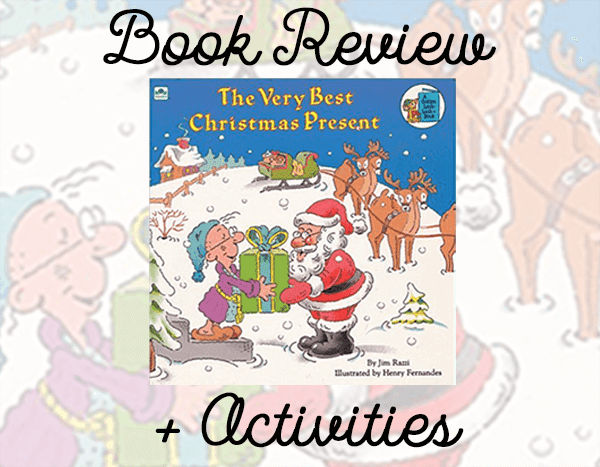 The Very Best Christmas Present is a very sweet story and an excellent read-aloud. My copy is the one I bought my youngest son when he was six years old. OPENING: "One snowy morning, a few weeks before Christmas, Mr. Floogle's doorbell rang. It was the mail carrier. He had a big orange cat in his arms." SYNOPSIS: Mr. Floogle receives an unwanted cat. He repeatedly tries to give it away because, as he reminds us over and over again, "I don't like cats!". When he finally succeeds he slowly realizes how much he really loves the cat and how badly he misses it. 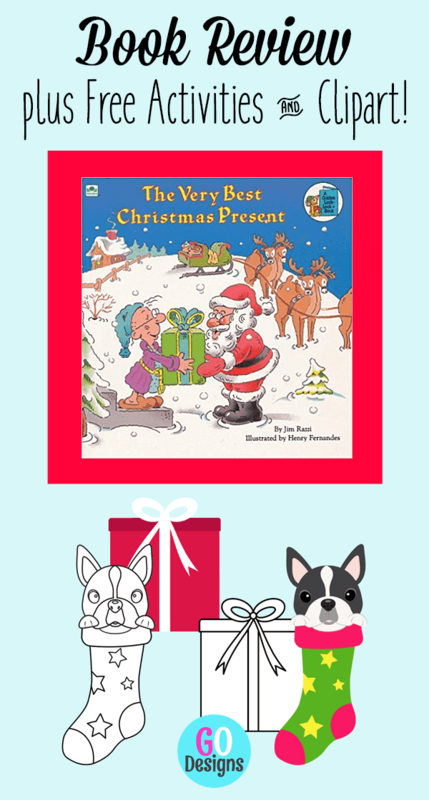 But happily, as you can see on the cover, Santa finds the cat and gives it back to him. WHY I LIKE THIS BOOK: This is such a lovely, heart-warming book. Mr. Floogle is funny in his determined grumpiness and insistence that he doesn't like cats. But there are little clues throughout the story that show the reader that the cat is quickly working his way into Mr. Floogle's heart. My first grade students always picked up on this and were completely satisfied with the happy ending. 1. Mr. Floogle doesn't have any friends, other than his new cat. This book is the perfect segue into a discussion about the many ways we can make friends and be a good friend. 2. It would be fun to graph who has a cat and who doesn't. Or perhaps who likes cats and who doesn't. 3. Draw pictures or write about the responsibilities of a good cat owner. 4. Before reading the book to your class be sure to cover the front of it (as it tends to give away the ending). Then read the story but stop at the part where Mr. Floogle mails the cat to the North Pole. Ask the kids to predict what they think will happen next. You could do this orally or in writing or pictures. Share the predictions and then finish reading the book. 5. Draw or write about the very best Christmas present for the cat or for your own pet. And here's a FREEBIE for you (look down)! Ideally it should be a cat in a stocking :) but I haven't made one of those yet. PS Before you go, be sure to check out my latest colouring book. 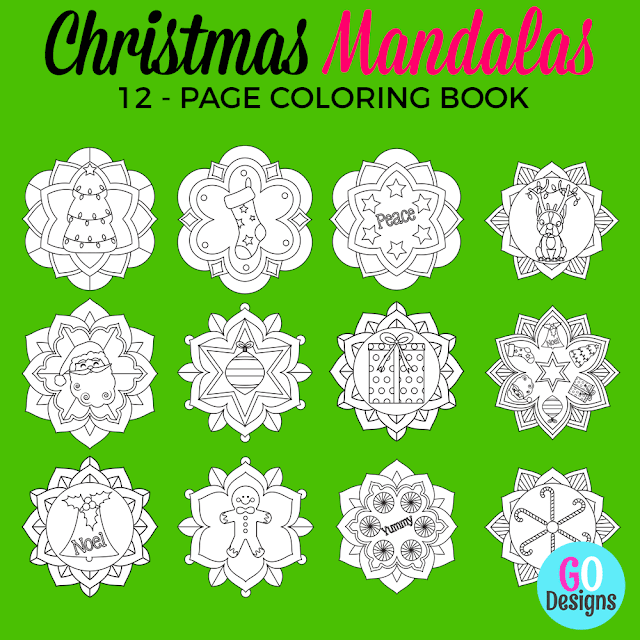 This one is 12 pages of Christmas Mandalas. They're perfect for the last week of school before the Christmas break! Barbara...I love the classic older books...thanks so much for sharing this one. You are always so generous with your crafts ideas...and I LOVE the suggested actvities that accompany the book suggestion. I'm sending all good wishes for a Happy and Healthy New Year! Hi Vivian! So lovely to hear from you ... and thank you for your kind comments. I wish you a happy and joyful New Year, also!